In an age when the government has significant technological resources at its disposal to not only carry out warrantless surveillance on American citizens but also to harvest and mine that data for its own dubious purposes, whether it be crime-mapping or profiling based on race or religion, the potential for abuse is grave. As such, any attempt by the government to encroach upon the citizenry’s privacy rights or establish a system by which the populace can be targeted, tracked and singled out must be met with extreme caution. 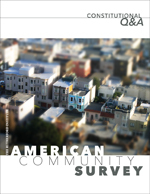 The American Community Survey (ACS) qualifies as a government program whose purpose, while seemingly benign, raises significant constitutional concerns. Empowered by Congress with greater powers to amass information about citizens, the Census Bureau introduced the ACS in 2005. Unlike the traditional census, which is limited to a simple head count every ten years for the purpose of establishing representation in Congress, the ACS is sent on an ongoing basis to about 3 million homes every year at a reported cost of hundreds of millions of taxpayer dollars. CHARLOTTESVILLE, Va. —Warning that representative government works best when the government’s actions are fully disclosed and citizens are allowed to speak honestly and openly to their elected representatives and other citizens without fear of retribution, The Rutherford Institute has issued guidelines for local boards, commissions and councils to consider and follow in order to best assure that the fundamental First Amendment rights of citizens are respected. In recent years, numerous local boards and commissions have attempted to establish rules and regulations governing speech at public meetings that limit the content and manner of public expression in an attempt to “dial down” the intensity of these meetings and impose a more “civil” discourse. However, these restrictions on expression often run afoul of the First Amendment, making local officials self-appointed censors and arbitrary arbiters of what speech is and is not proper. The Rutherford Institute’s Public Meetings Guidelines are available at www.rutherford.org. The Rutherford Institute issued its guidelines after being contacted by residents of Charlottesville, Va., who were concerned about draconian changes to the City’s public comment rules regarding the content, duration and protocol for making public comments at City Council meetings. The City’s revised procedures include restrictions on video recording, a prohibition on “improper” comments, exclusion of individuals for disruptive or disorderly conduct, and limitations on who may be addressed. In denouncing the guidelines as overly vague and ambiguous, Institute attorneys have advised City officials that the changes to their meeting procedures violate the letter and spirit of Constitution by imposing obstacles to transparency and citizen engagement. In calling on the Charlottesville City Council to revoke the rules it has adopted in order to ensure that Council meetings remain a forum for free speech, the Institute warned that if the City is serious about being a leader in the fight for open government, it must demonstrate a commitment to public participation in the democratic process. In 2015, Rutherford Institute attorneys advised the Greene County Board of Supervisors (also in Virginia) against rules adopted governing the open forum public comment period during Board meetings that could be used to censor unpopular but constitutionally protected speech. The Rutherford Institute, a national nonprofit civil liberties organization based in Charlottesville, Va., defends individuals whose constitutional rights have been violated and educates the public about threats to their freedoms. The Institute has spent more than 30 years advocating for transparency in government and championing the First Amendment right of the citizenry to speak candidly and openly to their elected representatives and other citizens. The architects of the American police state must think we’re idiots. Consider, if you will, that the U.S. Supreme Court, historically a champion of the First Amendment, has declared that citizens can exercise their right to free speech everywhere it’s lawful—online, in social media, on a public sidewalk, etc.—as long as they don’t do so in front of the Court itself. What is the rationale for upholding this ban on expressive activity on the Supreme Court plaza? Translation: The appellate court that issued that particular ruling in Hodge v. Talkin actually wants us to believe that the Court is so impressionable that the justices could be swayed by the sight of a single man, civil rights activist Harold Hodge, standing alone and silent in the snow in a 20,000 square-foot space in front of the Supreme Court building wearing a small sign protesting the toll the police state is taking on the lives of black and Hispanic Americans.